Perfumes and fragrance ads by Anjou. The Anjou fragrance line by Ernest Oswalt of the Campana Company of Batavia, Illinois launched in 1927. The perfume house of Anjou was created by Ernest Morgan Oswalt, founder of the Campana Company, incorporated 1927. 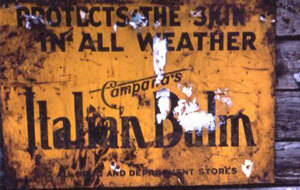 Established in Batavia, Illinois, the Campana Co. first produced the Campana Italian Balm hand lotion. The formula was purchased from Dr. Campana, a Canadian, where Oswalt took the name for his company. Ernest Oswalt was innovative with his advertising, as one of the first companies to offer free samples in magazine ads. The Campana ads were also heard on the 22-year running radio show "The First Nighter Program." 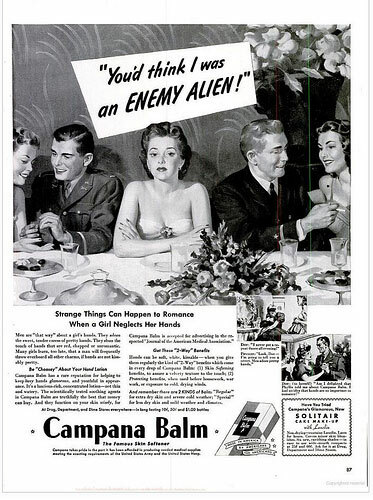 After WWII the company changed the name of their famous hand lotion to Campana Balm, due to the anti-Italian sentiment. I. Willard Crull, president of the Campana Company since 1942, focused on developing the fragrance line of Parfums Anjou and acquiring Old South Toiletries. The capital earned from the high sales of the balm paid for the Anjou fragrance line. Creative advertising was used for the perfume line. 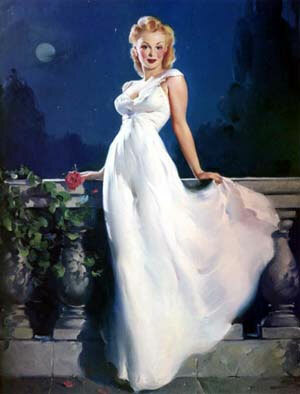 Famous pin-up and glamour artist, Gil Elvgren's 1945 Dream Girls illustration was reproduced for the Campana Balm Home Dispenser Gift Package, in-store display. In 1952, the Side Glance fragrance ad featured Ceil Chapman's fashions (Chapman was a favorite designer of Marilyn Monroe). Other artists illustrations used in the Anjou perfume ads include, T. Margo and Fernandez Balza. 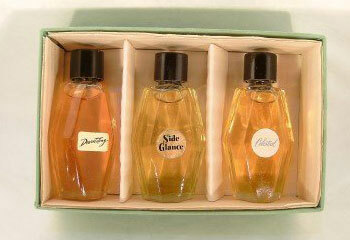 In August 1960, a set of three perfumes was available from Parfums Anjou in Batavia, Ill. The perfume set included: Devastating, Side Glance, and Celestial. Each bottle was approximately 2.5" high by 1.5" wide. The bottom marks on the bottles were as follows: Devastating, 4 raised dots in shape of a diamond; Celestial, 3 raised dots in shape of triangle; Side Glance, 1 raised dot. In 1956 the Campana Company was sold to Allied Labratories of St. Louis, a year after Ernest Oswalt died. Purex Corporation took over the company in 1962, and operations continued for 20 years. The building was then sold in 1982. Johnson, Jacqueline. 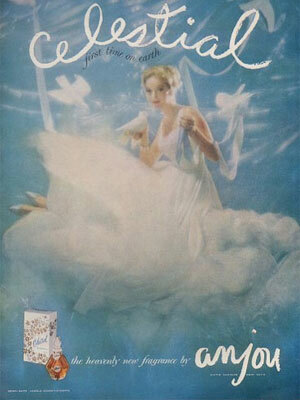 Classic Perfume Advertising 1920-1970. Pennsylvania: Schiffer. 2007.